“WAServes” is the eighth regional network in the country; it improves the quality of care and access to critical services for service members, veterans and their families. 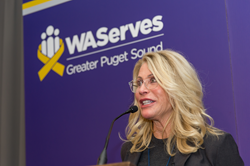 Sheri Schultz, co-founder, Schultz Family Foundation, speaks at launch of WAServes network. The Institute for Veterans and Military Families (IVMF) at Syracuse University and the Schultz Family Foundation today announced the launch of WAServes, a unique network of veteran service organizations that makes it easier for active duty service members, veterans and their family members to find services they need. At the heart of the WAServes network is a coordination center accessed via the web or by calling a toll-free phone number. The program launches with over 50 service providers and will initially serve King, Snohomish, Island, Kitsap, Pierce, Thurston, Mason and Lewis counties. With over 40,000 veteran organizations in the country offering medical, financial, employment, housing and other services, finding and accessing services has become the number one self-reported issue for veterans and their families, according to a recent Blue Star Families survey. IVMF’s AmericaServes’ networks solve this problem by bringing together a wide range of vetted service providers. Veterans and their families work through the local WAServes coordination center to identify what they need; and the center, run by WestCare Washington, matches them with service providers. Using HIPPA-compliant technology, each case is monitored to ensure people’s needs are met. WAServes is the eighth network to launch in IVMF’s national AmericaServes portfolio. The Schultz Family Foundation, founded by Sheri Schultz and her husband Howard Schultz, supported the launch of the first “Serves” network in New York City in January 2015 and is happy to bring the program to their home state of Washington. 3. In person by visiting any of the participating regional providers who can register people in the system and make referrals if needed. For more information about WAServes visit http://www.WAServes.org. For more information about AmericaServes visit americaserves.org. AmericaServes is the country's first coordinated system of public, private, and non-profit organizations working together to serve veterans, transitioning service members, and their families. Administered by the Institute for Veterans and Military Families (IVMF) at Syracuse University, AmericaServes’ vision is that every service member, veteran, and their family can easily access the full range of comprehensive services required to achieve their unique goals, and to provide a superior service experience to match the participants’ first-class military service. For more information, visit americaserves.org and follow AmericaServes on Facebook and Twitter. The Schultz Family Foundation was co-founded in 1996 by Sheri Kersch Schultz and her husband Howard Schultz, chairman and CEO of Starbucks Coffee Company. Guided by a belief that an “inequality of opportunity” is stifling America’s potential, the Foundation invests in innovative programs and partnerships that remove barriers to success and create new pathways to opportunity. The Schultz Family Foundation currently supports two national signature initiatives: Onward Youth and Onward Veterans. For more information, visit http://schultzfamilyfoundation.org or follow us on Twitter @SchultzFamilyFd.